Yawn. Another Monday morning working from home. 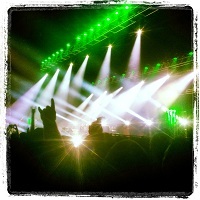 This time because I needed the extra little bit of sleep after the Chevelle concert at Carnival City last night. Seriously folks, a music concert on a Sunday night (and all the way out there! ), what are you thinking?! But more on that later. The weekend was pretty good. Busy in a very different way than usual. On Friday I headed home and whisked Gypsy off to the vet to have her stitches out. Such a good girlie :) And she's doing just fine. She does seem to be loving her new found freedom too. And so far she is very good about arriving back home as we do, or as soon as she spots us. Except for Sunday where she managed to get herself stuck on the other side of our garden wall, meowing her head off (and me returning the call to try and tell her where we were). Eventually she figured it out ... silly cat. 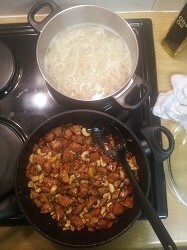 I decided we were having home made Kung Pow chicken for dinner. It turned out quite nicely :) Although I did alter their recipe a bit. We used 4 chicken breasts (2 just didn't seem likely to feed 3-4 people, let alone just The Trucker & myself) and I added chopped yellow pepper, chopped baby sweet corn and carrots. I also made some egg-noodles that I stirred in before we served. It was very yummy. Sadly no Szechuan peppercorn but I used our Phu Quoc Pepper instead. It was delish. Saturday morning the landlord arrived with our "extra" gardener. He's paying for this guy to come every 2nd Saturday. So anyway, that was helpful because he helped move the big plants that were just left outside our front door around into the garden. I started my morning off with a trip to the vet with Rex :( I took him earlier in the week because he has been sneezing. And he was still all snotty ... so I took him back. He got another injection and now has 5 days of antibiotics. Poor boy. So when we were done, we decided to go to Gourmet Garage for a late lunch (since we hadn't had anything yet!) / early dinner. Yum. I haven't had their Peanut Butter Burger and Chili Cheese fries in a while. So tasty! Then he headed to cricket and I went grocery shopping. I can't remember what I spent the rest of the afternoon doing, but it was exhausting general, around the house bits and pieces. At around 4pm, @clairam and her boyf came over for a pre-concert drink and to see the new house. And then we all piled into the car and headed off to Carnival City. Wow, that is one crazy colourful place. It looks like a clown threw-up. But the concert was quite good. Never been there before, but I far preferred it to the dome (except for distance). Much smaller arena and brilliant sound & lighting. But, the downside is being so short. Why does no one building these places with a sloped floor ... or with a stepped floor? I could barely see for the most part. I wasn't too bothered by that since we were really there for The Trucker who loves Chevelle, I barely know them.